You are here: Home » Features » 15 May: Press Matters ?? 15 May: Press Matters ?? Press Matters … Or do they? …. The news that the BBC has been banned from Ibrox (again) set me thinking. 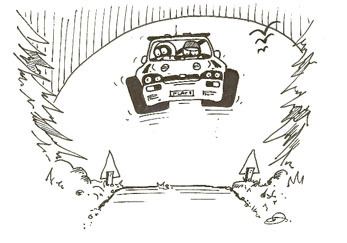 Dangerous stuff I know, but having recently attended the DCC Ingliston Stages rally, the Pirelli Richard Burns Foundation Rally and the Fort Augustus Rally Sprint, I can’t help re-thinking the whole issue of Press and Media folks attending rallies. All this head-scratching stems from that decision by the Granite City Rally organisers not to invite ‘the media’ to their event last month. As organisers and promoters, they were quite entitled to apply whatever rules they wanted on their own event. Other folks may well have different views, but they had their own and made decisions accordingly. They can’t be faulted for that, and I’ll leave any praise or criticism to others. On the other hand, Dunfermline Car Club took a rather different approach. Those who wished to attend for media purposes had to complete an on-line form, and then be approved before acceptance. As things turned out, 18 folk were accepted whilst others were refused. The Pirelli Rally took a similar approach, but they had tightened up the rules this year about who qualified as ‘media’ and who didn’t. In total, 53 applications were accepted (from over 100) and facilities were provided inside Rally HQ. The organisers of the Fort Augustus Rally Sprint had a more relaxed view of ‘the media’, but in all fairness this was not a major event. Even so, media representatives were asked to sign-on and were given a very comprehensive pack. This pack contained an updated entry list, a map of the stage and a timetable, as well as copies of all the other paperwork issued to competitors. A much appreciated service. The issuing of a ‘dangly’ also permitted media representatives to mingle with competitors in the service area. And that is the true value of media accreditation and signing-on, access to information and competitors. So why should the press be granted such privilege? And it is a privilege, not a right. There are a number of reasons worthy of consideration. For a start, accurate pre-event information is always welcome, for instance between an entry list being published in programmes and published on the day of the rally there can be changes to drivers and co-drivers, cars and classes, and that is critical information to the accuracy of any subsequent report or feature. Considering there can be over 100 cars and over 200 competitors it can take one journalist quite a wee while to get round everyone. Timetables can change too, so an up to date timetable is very desirable, plus a list of stages and where they are is always very beneficial. Additional information on stages is always much appreciated as it can add colour to subsequent rally reports. Stage maps are even more welcome, and have been used in the past by journalists to identify exactly where competitors may have had a problem. So what do the clubs get out of this, having made those facilities available? The primary reasons are publicity and exposure for their sponsors and their event. It might also swell numbers of spectators and takings at spectator car parks. And who knows how many folk might be attracted to the sport on a more regular basis either as spectators, club members, volunteer officials or even competitors. But the service is not just for the press. It is for the competitors who want exposure for their own sponsors and followers, and also for championship and event sponsors, and of course the fans and spectators who go home and want to read about their ‘heroes’ exploits in the newspapers and magazines and on telly and on the internet. Many folk go home from a rally not knowing exactly who won and who didn’t, and therefore rely on reports in the press and on the internet for such information. For sure, the on-event results service is excellent in the vast majority of cases, but these record stage times and overall positions, and some offer reasons for retirement, but they don’t carry the reasons (excuses?) from the drivers themselves or give mechanical or geographical details. Nor do the y relate the cuss words used to describe the circumstances. That’s usually down to reports from journalists who were there. If an event organiser thinks such a comprehensive reporting service can be provided by their own on-event press officer, then that is one view. I don’t see many independent publications or media services buying into that. Reporting can be every bit as competitive as competing, as each journalist tries to get a better quote or a different angle on the same story. Or is that what some folk want? Was Ibrox right? Football is rather different from rallying though. Such a ban won’t stop the press reporting on events, it just makes working life a bit more difficult. And whereas stadiums and arenas can deny access to anyone they don’t want, rallying is rather more difficult. Even motor racing circuits can stop folk from entering their premises, but rallying can’t, because most of it takes place on public property, whether it’s a public park or public forest, hotel or yard. And this is where a media accreditation system can work for the organisers. By issuing such accreditation they can insist that certain rules of access be followed and should folk infringe those rules then they can be refused access to facilities and information in the future. In other words they can exert some form of control over the press and what it reports. If there is no such system in place, then press representatives will be free to roam wherever they like and say whatever they want, and no rally officials will have the authority to deny them access to public places. That could result in anarchy. Sadly, things don’t always go well on motor sports events, and at times like these it is better to have the press on-side and know who exactly is attending a specific event. There will always be those unscrupulous journalists and photographers who will pursue any story no matter how distasteful their methods and the outcome, but there are good guys and bad guys in all walks of life and professions. If you have the majority on-side then some form of control can be exerted. It’s the same for genuine press photographers. They will always work within any guidelines and marshals’ instructions, but if they are not signed on, who’s to stop them going and standing where ever they like. This whole issue of press access is a thorny subject, and isn’t it a pity that far from facing this issue, the MSA have chosen to ignore it? What an example to set the clubs and the organisers. Until last year they had their own system of issuing UK-wide Media Accreditation. The trouble was, they didn’t stick to their own rules and the system was abused. So they have abandoned it. Now each club and event have been left to their own devices. It must be stressed that the Granite City organisers did not try to ban representatives of the press and did not try to stop them doing their job, but access to competitors at the Rally Start and Finish would have been much appreciated, instead of separated by barrier. Not inviting press won’t stop them reporting, but it might make life more awkward, and we don’t need that in what is still very much an amateur sport. Regular motor sports reporters and photographers will still be able to do their job regardless, but it’s the newcomers who won’t know where to get information, how to conduct themselves at venues and get access to competitors, who will be put off. So here’s the dilemma, should we deter the press from attending, or encourage them? Should we simply tolerate their attendance or welcome them?